I have decided to celebrate this Valentine’s Day with a few very pink photos. Now, I am very reasonable with the use of pink in my everyday life, but every now and then it’s fun to go a little overboard 🙂 I present to you: Howleen in pink, from top to bottom. To make the dress for this special occasion, I used the same fabric that I used for an Animator’s doll dress. I do think it’s a lovely one – the right kind of soft, baby pink with the right kind of cute polka dots. I wasn’t quite certain where the idea for the overall-type style came from – it’s never really been my style. Finally, it dawned on me after a while. I had been unknowingly inspired by the “Pink Jumper and Cat T-Shirt” Barbie Fashionista doll! The resemblance is really quite strong. This is a dress that I made for my own enjoyment, so there is no harm done, but this raises an important question – how often do images we see sink into our minds and then they come up in our thoughts as ideas that are seemingly all our own? In fact, but for the very real danger of unintentional plagiarism, looking at pretty things is a probably one of the bets sources of inspiration. I completed Howleen’s look with Birthday Ball shoes from Cedar Wood. Even though they are slightly big on her feet, they were definitely the choice that made the most sense, colour wise and theme wise. 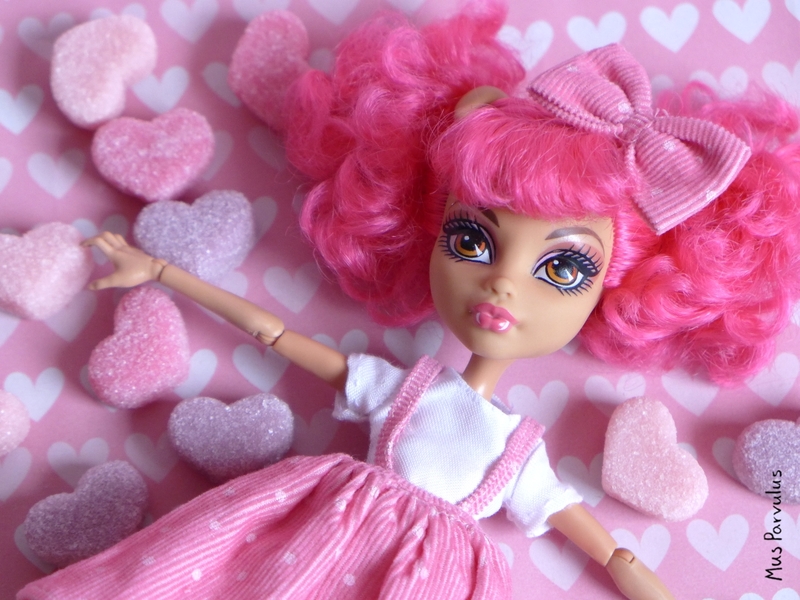 Howleen is portrayed as a younger girl (warewolf). This is reflected in her style and her build. She is slightly shorter and more slender in the chest area than her older friends from the Monster High line. This line starred different monsters as enthusiasts of different kind of music, with Howleen as a Hip Hop fan. I can’t tell if her outfit is typical of a Hip Hop performer, but it certainly looks comfy for practice. The leggings and the leotard are, unfortunately, one piece. The whole outfit seems to be themed around sweet, bright colours and paw prints. The aforementioned ‘edginess’ comes from the inclusion of safety pins in the design and her big boom box shaped bag. Personally, I find safety pins to be more reminiscent of Heavy Metal, but they look fine on her. The shoes look fairly simple, but are unique in that they are among rather few pairs of sporty shoes in the realm of Monster High – it seems that fancy & smart ones dominate. Howleen theoretically has smaller feet than the young adult dolls, but normal shoes fit her so-so and look passable. I don’t know why. I am no longer trying to understand, I have just let it be. This hairdo makes me happy 🙂 I also like the very pink lips. I don’t know if it’s the conditioning by Barbie products in childhood, but sometimes this weird affinity for pink still surfaces. I like Howleen as she is, overall – and I guess that includes the ears and he fangs. I have, nonetheless, thought that perhaps I would like her even more as a normal girl. The fangs could easily be painted over, and I found a very good tutorial on removing the wolf ears. And then I realised that if I cut off her wolf ears, she won’t have ears at all! I am not confident in my ability to sculpt tiny human ears, so she’s staying in wolf form for the foreseeable future. The fact that Howleen is a (younger) teen has opened some new photo opportunities. She is the first doll who seems at home in the teen room in my IKEA Spexa paper dollhouse.